Can good triumph over Evil once too often? The ultimate triumph of Good and Light has transformed the world into a place of sweetness and peace. This is bad news for the 'bad guys,' who include a depressed assassin who dresses in black, his short, feisty sidekick, a black knight, a female Druid, a man-eating sorceress and an innocent centaur who is a spy for Good. Finding utopia boring, they set out on a quest to restore balance to the world. It has been said that it would take circumstances that were drastic and strange in the extreme to ever allow a group of people of darkness to work together … but perhaps the otherwise inevitable destruction of the entire world was just enough. This book takes the typical 'band of heroes on a quest to get the mcguffin and defeat evil' generic fantasy and turns it upside down. First, you've got to understand, I already love those type of stories to begin with. Also, the villains in a lot of tales are my favorites. That being said, this book is spectacular! Seriously, I can't recommend strongly enough that if you can get your hands on it - because it is out-of-print and crazy difficult to find - that you should buy it. So, the crux of the story is that Good won the big final battle. Evil was soundly routed. We can all live in peace and harmony now. But wait! The world is too good. There's to much light and it's ripping a hole in reality and if we don't get some 'evil' ten the world will implode and cease to be. I love that. I've always had this belief that good can't exist without evil and evil can't exist without good. It's kind of a yin/yang thing in my mind and I love that a fantasy book finally took that sort of outlook. Just like the characters. These people aren't the 'kick the puppy' sort of evil, which is great because I've always thought that was nothing but a caricature anyway. I love the characters and how real they feel. Yeah, they're 'evil' but they're not bad people. Not really. I love the characters, each and every one of them. You have the confused centaur that's a spy, the literally man (and woman - and most other sentient beings) eating sorceress, the diminutive thief whose roundness is due in part to carrying his 'property' around with him, the mute dark knight whose helm is welded shut, the last Druid seeking to restore balance and (my personal favorite) the assassin who dyes his hair black. 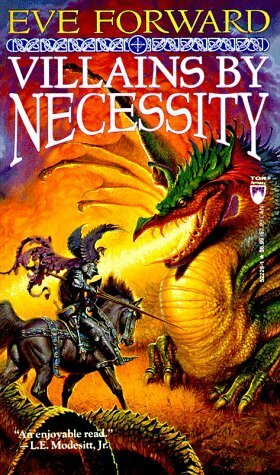 Beyond that though, there's a lot of similarities between this and 'heroic epic fantasy'. You've got the quest to find the mcgufin. The antagonist (that I think is the real 'evil' in this book and that just shows how talented Forward is). You even have a bit of respectful adversaries for our villains. I love the way the author handled the whole 'good vs. evil' thing we always see in fantasy books - and there was even quite a bit of feminism. And for a book published in the mid-90's that's a breath of fresh air.